On October 14th I had to travel directly from one event (the opening of the first Bartholomeus van der Helst solo exhibition in the world) to another (the ‘End of Lost-3’ dvd night at my cousin’s). So I got to have dinner on the train from Amsterdam to Utrecht. Poor me? Not at all! This ‘ekiben‘ (that was made by myself and not bought on the train nor station; hence not a real ekibento) is all made up of leftovers. In the left bottom corner is a SnackTaxi bag containing cassava crackers, accompanying coconutty tempeh terik and nasi goreng in the bottom tier. Sliced gherkin acting as baran for a sour touch. The tier above carries another Indonesian dish: sambal goreng cabbage. I’ll share the recipe as part of my cabbage favourites feature when I have more time on my hands! Next to that is a delicious fennel & bean dish from the Puur Plantaardig cookbook by Jacinta Bokma (here’s the dish at dinner time), garnished with radish flowers and, after a lettuce divider, followed by the last bit of caramelised fennel also filling my previous bento. Last but not least the side container holds cooking pears stewed in wine, sugar and cinnamon for dessert. There was a SMALL problem with the recipe as Mr Gnoe had jotted down 2 liters of red wine, which should have been deciliters — as I concluded when the first bottle of Rioja filled my pan to the brim. ;) Still, they were tasty and look gorgeous, don’t they? 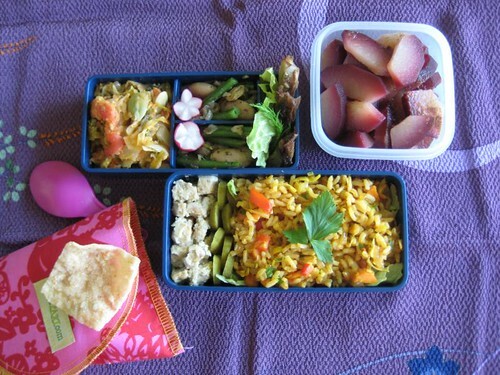 That’s all about this autumn bento! As always, looking good. What a great idea to use wine to make stewed pears!